Eye, Cambridgeshire, High Street circa 1909. Eye is a village close to Peterborough in the county of Cambridgeshire. This slighty out-of-focus postcard was by an uncredited photographer and was posted in September 1909 to an address in Norwich. Looking at the Google Street View the village seems to have retained its peaceful rural character. Click the postcard to enlarge. Hanwell, West London, Rosebank Road circa 1911. 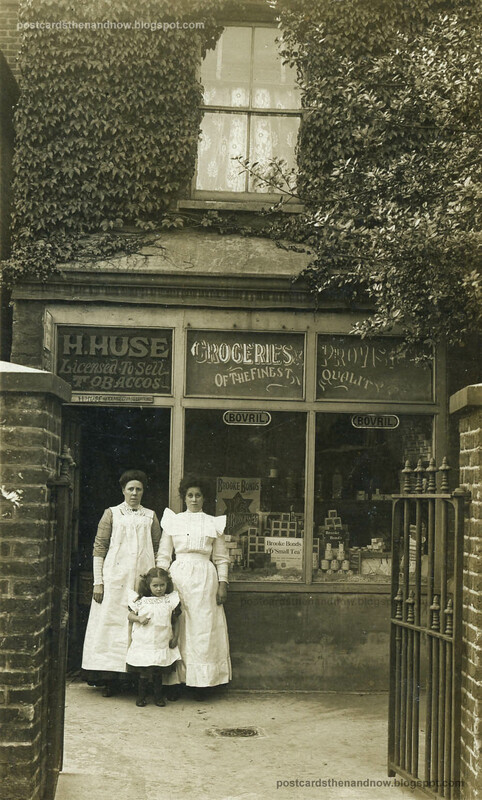 This postcard by an uncredited photographer shows the small grocery shop of H. Huse which has been added to this private house. In the Google Street View you can see the shop front has reverted back to being a private house. The people on the front are identified on the back of the postcard - On the left, Mrs Eliza Eggleton, on the right, Mrs L Addams. In front is Edith Flitter who was adopted, presumably by one of the ladies in the picture. Edith was 4 years old in 1911 (data from 1911 census) so I think that ties up the date fairly accurately. I've included a detailed 600dpi view of the shop below. For more old pictures have a look at this week's Sepia Saturday blog where the theme is shops. 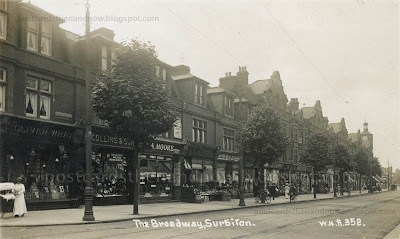 Surbiton, Surrey, The Broadway 1913. The architecture and character of Surbiton's main shopping street has changed little in the last hundred years. More traffic of course, but it still has a pleasant, unpretentious feel to it. Postcard by W. H. Applebee of Ashford. Click the postcard to enlarge. 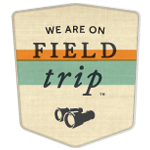 Ps, a big hello to visitors who've arrived here from The Atlantic Cities! 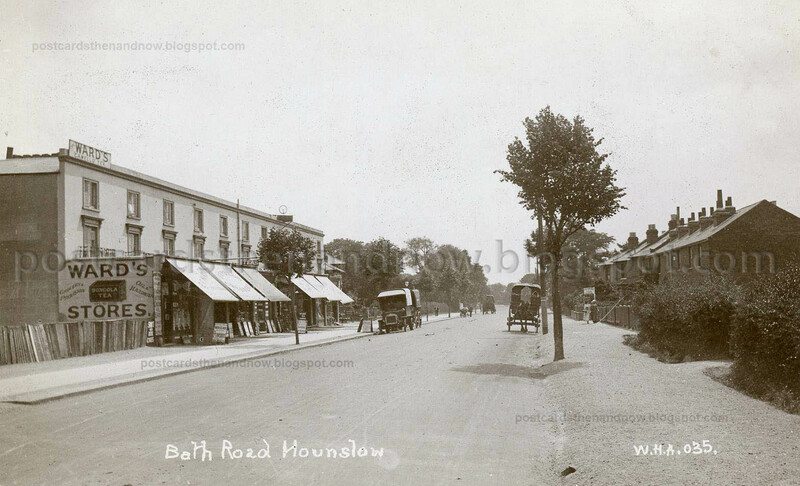 Hounslow, Middlesex, Bath Road c1913. 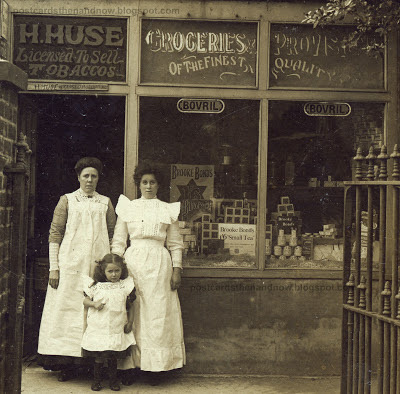 When this photo was taken, the shop next to Ward's Stores had not yet been built. Ward's Stores and the other shops look run-down now. The houses on the right have gone. Postcard by W. H. Applebee of Ashford. Click the postcard to enlarge. 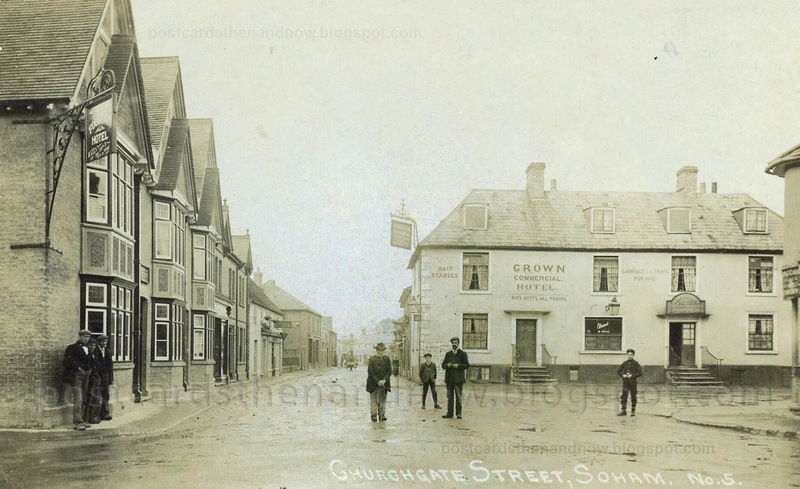 Soham, Cambridgeshire, Churchgate Street circa 1908. 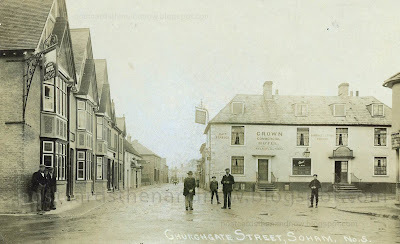 The Fountain pub (16th century, rebuilt 1900 after a fire) on the left is still in business, but the Crown Commercial Hotel on the right, perhaps open by 1701 and well equipped to take guests in 1816, closed in 1967. It is now private houses. Postcard publisher not known. Click on the postcard to enlarge. For more old pictures have a look this week's Sepia Saturday blog. 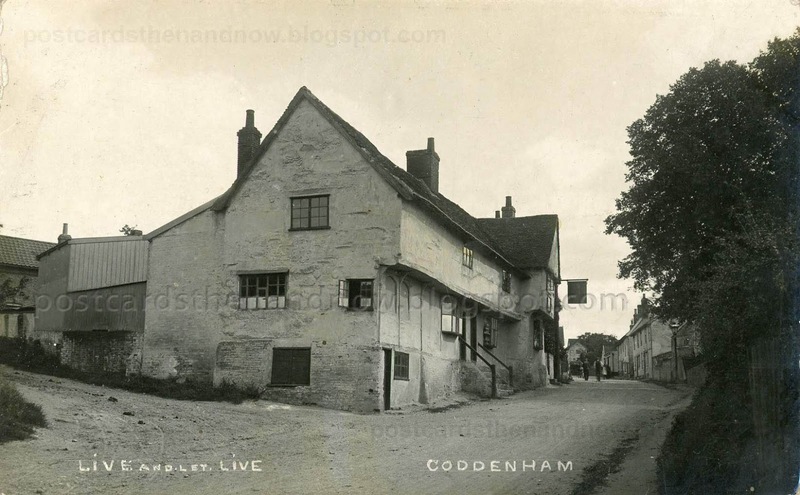 Coddenham, Suffolk, The Live and Let Live pub, c1908. Coddenham is a small village north of Ipswich. The wonderfully named Live and Let Live pub appears to have closed in 1912. It is now a private house and has presumably been so for a hundred years. The building is clearly ancient. If you open the Google Street View in another window and get closer to the building you can see that it is beautifully decorated on the outside. I'm not sure about the pink paint though. 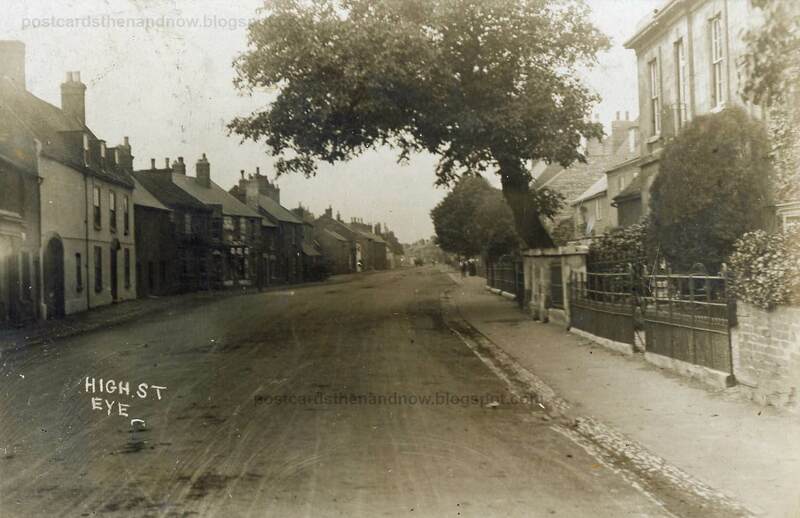 For more old pictures why not visit the Sepia Saturday blog. This postcard was produced by Bedford and Co of Carr Street, Ipswich.